The most dangerous time in a teen driver’s life is the first 12 months of independent driving. Teens crash most often because they are inexperienced. Most fatal nighttime crashes involving teen drivers happen before midnight. Teens really do learn to drive from watching their parents’ safe driving. More than half of teens killed in car crashes were not wearing a seat belt. Watch the video below and answer the questions that follow. In your science notebook, answer the following questions. What are some of the differences that you noticed between the two car crashes shown in the video? What safety features of the car were utilized before and during the crash? Take the car-safety quiz below. To retake the quiz, reload the page and then select "No" when the "Resume Quiz" dialog box appears. Did you know that all objects are naturally persistent? Yes, they are indeed. Objects tend to continue doing what they are doing unless influenced by an external force. Click on the picture below to play with the simulation. Then, in your science notebook, answer the questions below. What is the initial action of the sled and statue when you open the link? Using your computer mouse, click, hold, slide, and let go of the sled to the left. Describe what happens. While the sled is moving, click on it again. Describe what happens. Now, using your computer mouse, click, hold, slide, and let go of the sled to the right. Describe what happens. Finally, while the sled is moving, click on it again. Describe what happens. What do clicking, holding, and sliding the mouse represent? If you did not click on the moving sled, what would happen? Most people are aware that heavier objects require more force to move the same distance as lighter objects in the same amount of time. In this activity, you are going to manipulate the masses of two sleds and the force acting on them to compare their acceleration. Click on the picture below to play with the simulation, and then follow the instructions. 1. In your science notebook, copy the table below. 2. Designate the sled on the top as sled A and the sled below as sled B. 3. You can manipulate the sleds’ masses and forces by clicking on the plus and minus signs. 5. Reset to change their masses and forces. 6. Use the simulation to complete the table you created in your science notebook. Change the masses and forces of the two sleds as indicated in the table, and then record the acceleration of each sled. 1. Describe the motion of two sleds of equal mass when the amount of force exerted on them is not equal. 2. Describe the motion of two sleds of different mass when the amount of force exerted on them is equal. 3. Is it possible for two sleds with different masses to have an equal acceleration? Explain and provide evidence. Why does it hurt when you accidentally bump into a concrete wall? Why do insects splatter when they hit your windshield? In this simulation activity, you will discover what happens when two objects come into contact with each other. Click on the picture below to play with the simulation. Then, follow the instructions. 2. Designate the sled on the left as sled A and the sled on right as sled B. 5. You will reset to change their masses and forces. 6. Complete the table you created in your science notebook by using the simulation. Change the masses and forces of the two sleds as indicated in the table, and then record the acceleration of each sled. What did you notice about the acceleration of the two sleds with equal mass when you launched them at different amounts of force? What did you notice about the acceleration of the two sleds launched with an equal amount of force when the mass of one sled is twice the mass of the other? Isaac Newton introduced the three laws of motion. These three laws were the foundation of the science behind the motion of objects being acted upon by forces. The objects could be large objects, such as planets and stars in the universe, or they could be small objects you can find on Earth, such as cars and baseball. Click on the video below to learn more about Newton’s Three Laws of Motion. What does Newton’s First Law of Motion state? What is the other name for this law of motion? Write the mathematical formula for Newton’s Second Law of Motion and write an explanation. What does Newton’s Third Law of Motion state? Using your knowledge about Newton’s Three Laws of Motion, write your own example of each law. Make sure to support your examples with detailed explanations. Recalling the video from the Engage part of this lesson, use the concepts you have learned from Newton’s Three Laws of Motion to explain what happened to the dummies. “a” is the acceleration of the object expressed in meters per second squared (m/s/s). Here’s an example of a problem involving Newton’s Second Law of Motion. A student pushed a wagon with some garden plants in it. The total mass of the wagon and the garden plants is 45 kg. If the wagon accelerates at a rate 0.95 m/s/s, how much force did the boy exert to push the wagon? In your science notebook try to solve this problem. Show your work to your teacher once you finish. A crate is dragged across an ice-covered lake. The box accelerates at 1.18 m/s2 and is pulled by 67 N of force. What is the mass of the box? Round your answer to the nearest hundredth. Now let’s further investigate Newton’s Second Law of Motion using a simulation lab. 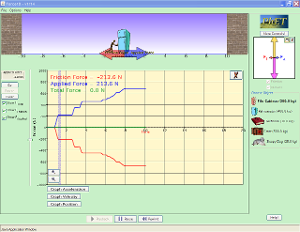 Download “Investigating Newton’s Second Law (Using a Simulation)” from the Related Documents. Make sure you have Java installed in your computer in order for the simulation to run. Click on the picture below to start the simulation. When it asks, "Do you want to run this application?" click "Run." Take the quiz to check your understanding about Newton's Three Laws of Motion . This resource is a collection of interactive materials, videos, and other digital media assembled in a conceptually scaffolded 5E lesson format. It provides alternative or additional tier-one learning options for students learning about Newton’s Three Laws of Motion—Physics TEKS (4)(D). The assignments require student participation with self-checked and teacher-checked formative assessment opportunities. For example, after students record observations and data in their notebooks, they may be prompted to be prepared to share their answers with the class. Review the resource before assigning it to your students to check for prerequisite knowledge, differentiation needs, and student follow-up requirements as necessary. Students will need a science notebook or something in which to record their responses. ENGAGE Safety First Discuss importance of safety belts and airbags as safety features of cars. Self-test about safe driving. EXPLORE 1 Keep Going and Going Define inertia. Provide examples of objects that demonstrate Newton’s First Law of Motion. EXPLORE 2 Moving at the Same Rate Discuss how force is affected by the mass and acceleration of an object. Provide examples of how mass and acceleration affect the force on an object. EXPLORE 3 Equal but Opposite Explain the Law of Action and Reaction. Give examples of action-reaction pairings. EXPLAIN Laws of Motion Briefly discuss Newton’s Three Laws of Motion and provide valid examples. Teacher or class debrief. to solve sample problems involving Newton’s Second Law of Motion. NOTE: Make sure you have Java installed in your computer in order for the simulation to run. Self-check using other sample problems. EVALUATE Newton’s Three Laws of Motion Quiz Use the concepts of Newton’s Three Laws of Motion to describe the motion of an object. F = m x a Self-check.